late 1950s and early ’60s, scientists were stumped by a rib wound that almost surely killed him, hypothesizing that it could have been caused by a hunting accident or even a fellow Neanderthal. New research suggests that Shanidar 3 may have had a more familiar killer: a human being. Using modern-day forensics, Steven Churchill, an associate professor of evolutionary anthropology at Duke University, has determined that Shanidar 3’s wound was most likely caused by a thrown spear. At the time of his death, only humans, who had adapted their hunting techniques to the open plains of Africa, had developed projectile weapons; Neanderthals, who hunted in the close quarters of forests, used thrusting spears. The study, published this week in the Journal of Human Evolution, is part of a growing body of evidence that suggests contact between Neanderthals and humans was often violent and may have played a part in the extinction of our closest prehistoric relatives. 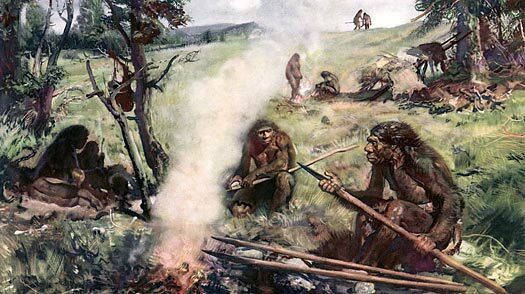 Squat, rugged, and well suited to cold, Neanderthals dominated Eurasia for the better part of 200,000 years, surviving an ice age, but the species mysteriously disappeared around the same time modern humans spread out from Africa into their habitat. To learn the cause of Shanidar 3’s wound, Churchill and his team used a specially designed crossbow to fire stone-age projectiles at precise velocities at pig carcasses . When he stabbed a pig carcass with the force of a thrust spear, Churchill found that the pig’s ribs “were busted to hell. The high kinetic energy had caused a lot of damage in the area.” But Shanidar 3 had a solitary rib puncture with no such damage. At kinetic energies consistent with a thrown spear, the pig’s rib bore damage resembling Shanidar 3’s isolated rib puncture. What’s more, Churchill found that the weapon that killed Shanidar 3 entered at about a 45-degree downward angle. According to Churchill, “That’s consistent with the ballistic trajectory of a thrown weapon, assuming that Shanidar 3  who was about 5 ft. 6 in. [1.67 m] tall  was standing.” Churchill also found that Shanidar 3’s rib had started healing before he died. By comparing the wound with wounds documented in medical records from the American Civil War, a time before antibiotics, Churchill hypothesized that Shanidar 3 probably died within a few weeks of the injury. While Churchill’s research may have shed more light on the cause of Shanidar 3’s death, the reasons for his species’ fate remain a mystery. Some scientists believe that Neanderthals went extinct after a particularly volatile period of climate change shrank their arboreal hunting grounds. Others suggest they may have interbred with humans. A newer theory focuses on a violent end at the hands of Homo sapiens. Earlier this year, Fernando Rozzi, an anthropologist at Paris’s Centre National de la Recherche Scientifique, found a Neanderthal jawbone that had been butchered in precisely the same way that humans cut up deer carcasses in the early Stone Age. Rozzi said humans likely cut out and ate the Neanderthal’s tongue and used his teeth to make a decorative necklace. “Neanderthals met a violent end at our hands, and in some cases we ate them,” Rozzi said at the time of the discovery. the species that Shanidar 3 came into contact with in his Iraqi home  a creature capable of both cooperation and violent confrontation  is most certainly the same species that dominates the globe today. Read an interview with ‘Lucy’ discoverer Donald C. Johanson.